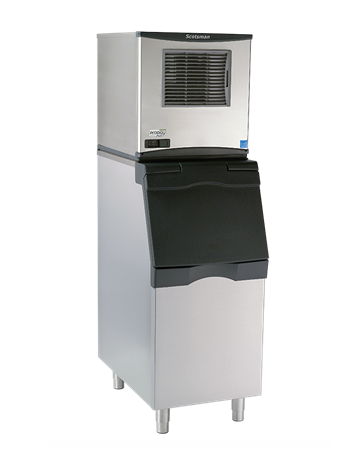 Scotsman makes ice for a wide variety of restaurants, hotels, healthcare facilities and other industries. While these machines are built to stand the test of time, an issue might pop up here and there. When you’re troubleshooting a Scotsman machine, you’ll notice that some models display diagnostic codes or lights to notify you when something is wrong. But what do they mean? Below are Scotsman ice machine error codes to help you diagnose the problem quickly. Below are diagnostic codes for Scotsman Prodigy modular cubers, including C0322, C0522, C0722, C0330, C0530, C0630, C0830, C01030, C01448, C01848 and C02148 models . 1 – Long freeze time. Shutting down. 1 (flashing) – Retrying long freeze cycle. 2 – Long harvest time. Shutting down. 2 (flashing) – Retrying long harvest cycle. 3 – Water filling slowly. 4 – High discharging temperature. 5 – Failed sump temp sensor. 7 – Failed discharge temp sensor. 8 – Retrying short freeze cycle. 8 (flashing) – Thin ice from short freeze cycle. Below are diagnostic codes for Scotsman Prodigy flaked and nugget ice machines, including F0522, C0822, F1222, F1522, N0422, N0622, N0922 and N1322 models. 1 – No ice sensed. Shutting down. 1 (flashing) – No ice sensed. Retrying. 2 – Auger motor high load. Shutting down. 2 (flashing) – Auger motor high load. Retrying. 3 – No water in reservoir. 4 – Refrigeration pressure too high or low. Below are diagnostic codes for Scotsman AutoIQ™ cubers, including CME256, CME506, CME656 and CME806 models. This occurs with the unit off. This occurs with the unit on. This occurs when the fan motor doesn’t turn. Need more diagnostic help with an ice machine? Check out our library of Scotsman manuals for tips and information.